Welcome to one of the top Nashville recording studios, Play It Again Demos. Great gear, top session musicians and a producer that cares about your songs are at your disposal. Yes, you are welcome to be present as your project is recorded or even sing and play on it. We will record any number of songs in our regular tracking sessions, but to come in and be present for a project there is a three song minimum. Just think how thrilling it will be to meet musicians of the highest caliber and rub elbows with some of the most talented people on the planet! But there are numerous Nashville music recording studios, why have your songs recorded here? 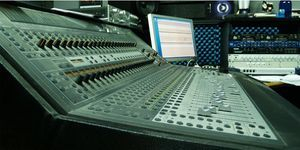 Because of our extensive experience, the high quality of our equipment, the superior level of talent available and most of all, the high caliber of people who work here, people who care enough to do your songs right. Most of all, we are not just a recording studio, we are a team whose default mode is to automatically produce your songs, not just provide studio time and an engineer then wish you luck as you flounder about way over your head. You'll never be treated callously, be patronized, be exposed to arrogance or be made to feel anything less than family here. We're not just A Nashville music recording studio, We're YOUR Nashville music recording studio!